NCSU: “New research from North Carolina State University shows that some smartphones specifically designed to support the Android mobile platform have incorporated additional features that can be used by hackers to bypass Android’s security features, making them more vulnerable to attack. Android has the largest share of the smartphone market in the U.S. In essence, these pre-loaded apps can be easily tricked by hackers. For example, these “backdoors” can be used to record your phone calls, send text messages to premium numbers that will charge your account or even completely wipe out all of your settings. However, five other models did not fare as well. 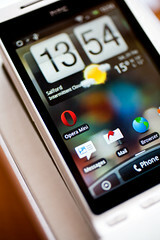 HTC’s Legend, EVO 4G and Wildfire S, Motorola’s Droid X and Samsung’s Epic 4G all had significant vulnerabilities – with the EVO 4G displaying the most vulnerabilities. The full paper, with technical details, is available here. The researchers notified manufacturers of the vulnerabilities as soon as they were discovered, earlier this year. Researchers now plan to test these vulnerabilities in other smartphone models and determine whether third-party firmware has similar vulnerabilities.